Hmm. Well, Halloween seems to polarise opinion in this house. I love Halloween but the Husband hates it. We have just returned from ASDA to stock up on ghoulish bits and pieces and he is in the kitchen muttering about tat and plastic whilst whipping up a curry and listening to his terrible Viking Rock. Perhaps it is just for the kids but it’s surprising how many of us have our own little Halloween Family Traditions. We always make an effort with our Halloween costumes. Helena likes to read spooky stories to her kids whilst Emma (TheMinisAndMe) always has a themed buffet and invites her kids’ friends around for a few games and apple bobbing before heading out trick or treating together. Lianne (Anklebitersadventures.co.uk) makes sure her house is decorated from top to bottom and likes to buy a special decoration every year that she allows her little ones to choose from. Anthea (Bluebearwood.co.uk) creates a fearsome Pepper Brain Monster which they only ever eat during October. (Find more healthy eating Halloween food tips for kids here). Leandra (Lara Bee UK) has a Halloween cauldron which she fills with Halloween goodies much like a Christmas stocking. She says it might be over the top but Halloween is a holiday they all love. We decorate the house and lay on a special Halloween tea usually featuring my Halloween brain jelly and lots of ghoulish cakes. Let’s be honest it’s a bit of a sugar fiesta but we try to eat healthily for the rest of the week. 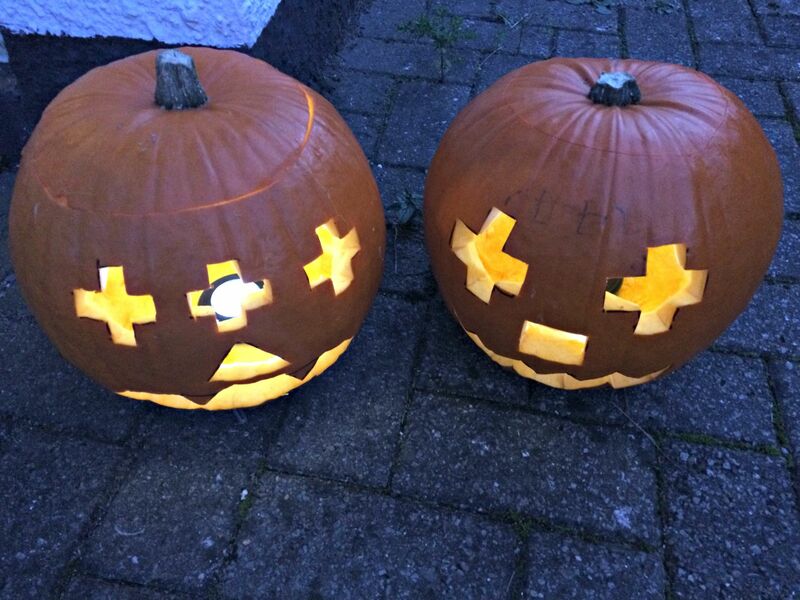 Have a pumpkin carving competition – who can create their masterpiece quickest? Holding a doggie Halloween fancy dress competition – whose pooch is the most terrifying? Try some fun fortune telling. Become Madam Zara for the night and predict some happy tidings if your guests cross your palm with chocolate coins. Hold a Halloween music contest – get your resident film buff to download the theme tunes to the top Halloween films and see which team gets them all right. Or, play know your monster – create some flash cards of the most gruesome ghouls and ghosts and see how many your guests will recognise. Whatever you do, play safely and keep all costumes away from lit flames. Make sure you know if any of your guests have allergies and keep all foods that could be a choking hazard away from little ones – including whole grapes and marshmallows. Do you have any Halloween family traditions? "Problem Page Edition 42 2017"